Angelina Jolie’s leg was the star of the Oscars, stealing the show with its attention-seeking antics. But Angelina Jolie’s lithe leg was kept covered up yesterday as the actress snapped right back to motherly duties. While the actress may be keen to move on from her overexposed limb, the rest of the world isn’t quite as ready to forget. As Angelina Jolie, 36, was busy shopping with her twins Vivienne and Knox in Beverly Hills, hilarious spoof images of the star were going viral across the net. Bloggers and artists were having some fun with Photoshop last night, circulating pictures of Angelina Jolie’s now-infamous right leg slotted into well known photographs and artwork and onto unlikely candidates. Just 24 hours after the ceremony Angelina Jolie “legbombing” was a viral term with that very skinny leg appearing next to Darth Vadar, on the Statue of Liberty and countless others… with side-splitting results. Even Brad Pitt was given the Photoshop treatment. 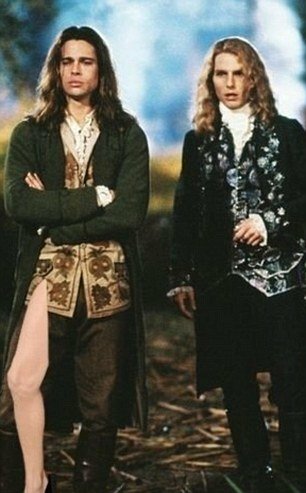 Brad Pitt’s character from Interview with the Vampire, Louis de Pointe du Lac, getting a leggy makeover. The limb also makes a stealth appearance on the cover art of The Beatles Abbey Road album. Angelina Jolie is yet to comment on the attention her awkward red carpet pose has attracted, instead keeping her head down during her shopping trip with the twins and Brad’s mother Jane. But countless other A-listers have chucked in their two pennies worth on Angelina Jolie’s now famous pose. A-lister Joan Rivers branded her a “fool” while others remarked on the scrawniness of her leg. The night before, most of the Oscars headlines had been dominated not by the winners, but by Angelina Jolie’s leg-baring antics. While Angelina Jolie sashayed down the red carpet before the ceremony, stealing the spotlight from Best Actor nominee Pitt with her leg-baring antics, social networking sites were quickly heating up with thousands of comments about “Angie’s right leg”. As she posed at different points along the red carpet the actress was captured continuously adjusting her Atelier Versace gown to ensure the cameras caught the leg from every angle. The limb in question quickly became a trending topic on Twitter, with users debating over her enviably trim thigh, the slightly awkward and over-enthusiastic pose, and joking about the emphasis on her right leg in particular. So far the account has attracted over 28,000 followers. And if fans thought they had seen the last of the limb when the awards ceremony commenced, they were certainly wrong. Perhaps already informed of the hoopla by her people, or simply enjoying the attention, Angelina Jolie continued to pose up a storm when she took to the stage to present an award. Walking onstage to present the gong for Best Adapted Screenplay, Angelina stopped at the microphone for several seconds with her hand on her hip and THAT leg on full display again. With wolf whistles and cheering from the audience, Angelina Jolie giggled at the reaction before continuing with the presentation. But not everybody was as taken with the actress. The screenwriters for The Descendants, who won the award, were quick to mock her as they accepted the award. While Alexander Payne, who also directed and produced the film, made his speech, fellow screenwriters Nat Faxon and Jim Rash mimicked Angelina Jolie’s pose in an exaggerated fashion, drawing laughs from the audience. Angelina Jolie’s father Jon Voight defended her antics during an appearance on Daybreak in the UK. Asked what he thought of her posing, Jon Voight said: “She comes out and does this pose and waits until people get it, it was so great. The audience responded so wonderfully too, with whistles and everything.